With Spotlight on Migrant Families Separated at the Border, Will Democrats Push to Abolish ICE? | Democracy Now! Democracy Now! correspondent and producer who has long reported on the criminalization of immigrants, family detention and the business of detention. On Saturday, President Trump blamed the widely condemned family separation practice on Democrats, tweeting, “Democrats can fix their forced family breakup at the Border by working with Republicans on new legislation.” Trump is set to meet Tuesday with Republican lawmakers to discuss a so-called compromise immigration bill they claim would end family separation while lifting limits on how long families can be detained, and which also includes a promise of $25 billion for Trump’s border wall. Democracy Now! 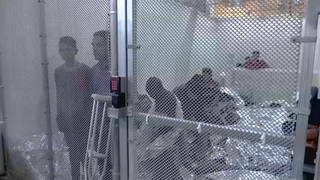 correspondent Renée Feltz discusses a history of family separation that has stemmed from previous legislative compromises with Democrats, and looks ahead to calls for them to defund Immigration and Customs Enforcement (ICE), if they gain control of the House in November. On Thursday, House Republicans introduced a so-called compromise immigration bill, alongside a more conservative alternative. The plan includes the promise of $25 billion for Trump’s border wall and is being touted as a way for Democrats to agree to pass legislation that would stop the separation of families. For more on what the Democrats might do now as they condemn the Trump administration’s new policy of separating families at the border, we’re joined by Renée Feltz, Democracy Now! correspondent and producer, who has long reported on the criminalization of immigrants, family detention and the business of detention. She just came back from South Texas. RENÉE FELTZ: That’s right. So, Trump is trying to say this isn’t their policy, the Democrats made us do it. One of his advisers, Stephen Miller, is actually saying, “It is our policy to do it.” His head of Department of Homeland Security, Kirstjen Nielsen, is saying, “We’re not actually doing it.” And then, Attorney General Jeff Sessions is saying, “God wants us to do it.” So, you know, that’s where we are in terms of the responsibility here. But as a reporter, I’ve been following the money, as Antar referred to earlier, with the business of detention, under the Obama administration, for some time here on Democracy Now! And many reporters, like myself, are calling—recalling this history of family detention under previous administrations, not so much to toot our own horn and say we were right, but more to say this is how Democrats have previously compromised on the issue of how we handle the surge of migrants coming to our country to seek asylum. In 2014, President Obama, as we reported here on Democracy Now!, opened detention centers for families. And his approach was to keep the moms with the children when they came together, although there was some consideration at that time of separating the families. But they didn’t really go that route, although, in many cases, we would see the father maybe peeled off and separated, while the mother and the child would be held in these facilities. So, there’s other examples of how Democrats have overseen the separation of families. For example, we saw, with people who were characterized as a criminal alien, people who had a green card or a legal ability to stay in the country but committed an offense, if they committed a crime, that was used to say, “Well, your citizenship potential is revoked, and now we can deport you from the country.” We’ve interviewed many people, including someone here, Jean Montrevil, who was deported from the United States to Haiti recently, under President—issues with President Obama, and separated from his young children. His daughter was also on our program. We’ve also seen Democrats never pass a Deferred Action for Childhood Arrivals, and so we saw separation under DACA, as well, from people from their parents. What we will see is this issue of family separation coming up in the 2020 Democratic primaries. We already saw a lot of Democrats coming to shelters and things like that. So the question is: What will Democrats do now, especially with the so-called compromise legislation that President Trump is going to meet with Democrats—I’m sorry, with Republicans about this week? AMY GOODMAN: I mean, it’s very interesting, because last week Trump said he didn’t support the Republican legislation, and then the White House walked that back. I want to go to Homeland Security Secretary Kirstjen Nielsen, who tweeted Sunday press and advocacy groups have misreported on the new “zero tolerance” policy, saying, quote, “As I have said many times before, if you are seeking asylum for your family, there is no reason to break the law and illegally cross between ports of entry.” That’s what she said. I want to turn to an asylum seeker named Michael, from Honduras, who spoke to Democracy Now! last weekend after he had been camped out on the bridge at the U.S. port of entry in McAllen, Texas, waiting to be allowed to request asylum. He had been waiting seven days at this point. MICHAEL: [translated] In my country, they were trying to convince me to go to the businesses and ask for money. They were extorting the businesses. They went to my house and tried to force me to extort people. I had a visa, but it was expired, so I went to make a new one, and they told me that I should come back later. But if I had waited for it, I wouldn’t be telling this story, because they would have killed me. I came from my house last Monday, and my mom called me on Wednesday and told me that they tried to pick me up again and to take me. I left Honduras three weeks ago. I’ve been here on the bridge for seven days. If they give me asylum, I’ll work hard and keep going on. I’ll try to bring my family with me, because they are also in danger. AMY GOODMAN: So, that’s Michael, an asylum seeker from Honduras. This is very interesting. You have Kirstjen Nielsen saying, “All we’re asking is that they go to the ports of entry.” But at the ports of entry, you found—you were just there on the bridge, Renée—that they were being told, the people who were coming forward, that they could not go over the bridge, the port of entry that they’re told this is the only place they can legally come across. RENÉE FELTZ: That’s right. And there seems to be a policy where the Customs and Border Patrol officers are stationed right in the middle of the bridge at these ports of entry, where U.S. meets Mexico, and they’re refusing to allow people to even walk down the U.S. part of the sidewalk to get to the building where there’s a port of entry where they can make their request. We just heard from Michael, who is a young man who’s saying he’s fleeing, essentially, gang violence. And we’ve seen Attorney General Jeff Sessions say that that’s no longer going to be accepted as a reason to come here seeking asylum, as well as women who suffer domestic violence. Now, what are we going to say when we look at what happens after Democrats and Republicans are done being outraged about the separation of young children from their parents? What about slightly older children, such as Michael, who’s 17? What about children as young as 10 or 11? Many of them might go on to be characterized as potential recruits for MS-13, who we’ve seen President Trump speak out against widely. Now, will the Democrats compromise and say we can agree to deport these type of kids or to put them into these juvenile detention centers, essentially, or will they claim that these young children should also be kept with their parents, in terms of keeping families together? And so, when we talk about following the money, some people are asking: If Democrats regain control of the House later this year, will they consider things like abolish ICE? If they’re so unhappy with Immigration and Customs Enforcement, will they cut off the funds? And if not, why? AMY GOODMAN: More than a thousand mental health professionals, now well over this number, and organizations have signed a letter condemning the new practice of separating nearly all children from their parents at the border. This is Dr. Selma Yznaga, a professor of counseling at University of Texas Rio Grande Valley campus, along the border in Brownsville. SELMA YZNAGA: The fact that kids are being forcibly separated from their parents has so much to do with the trauma that they are experiencing and that will have a huge effect on their behavior in the immediate future, in the near future and in the long term. To think that our government is putting kids through this kind of traumatic—and it is traumatic—experience to send a message to people who are fleeing their countries, not out of their own choice, but for their own survival, is—amounts to torture. AMY GOODMAN: “Amounts to torture.” Dr. Selma Yznaga is a professor of counseling at the University of Texas Rio Grande Valley campus along the border in Brownsville. Renée, you just spoke to her. RENÉE FELTZ: That’s right. She’s pointing out the trauma that children are facing. And we’ve heard that there is a failure to train the people in these shelters to help the kids deal with that trauma. We’re going to see these kids enter our public schools without any counseling—without enough counseling, people would say. So that’s a concern that people have. We may also see, if any of this Republican compromise legislation goes forward, a change that Republicans say would stop the separation of families, but in fact could do something worse: It could lift the 20-day limit that’s currently in place for families to be detained, and make it so that they could be detained without any limit. So that’s a major concern people have about the compromise legislation going forward and the type of trauma that children could face, not only from spending days or weeks in detention, but potentially months and even as long as a year, as they wait to be reunited with their sponsors or loved ones and family members here in the United States. AMY GOODMAN: Well, Renée, we want to thank you for your continued reporting and your reporting over the years. Tomorrow we’ll continue this conversation with Pramila Jayapal, who is the Washington congressmember—that’s from Washington state. She’ll be in our studio here in New York. She herself went to a prison in Washington to speak with mothers who had been separated from their children, sent up from the Mexico border. Democracy Now! correspondent Renée Feltz, and producer, long reported on criminalization of immigrants, family detention and the business of detention. This is Democracy Now! When we come back, we talk about Yemen. Stay with us.